Beautiful Beacon Hill! Fabulous, historic heart of Boston! Sweet 1-bd condo. Renovated, sweet one-bedroom condo. The 500 square foot, 2nd floor apartment (that's a 1st floor in Europe) in an attractive brick building is in the very center of Boston's historic district on coveted Beacon Hill. Two blocks to the Boston Common and Public Garden! One block to the shops, boutiques and restaurants on Charles Street. New kitchen, new bathroom, spacious bedroom, lofty ceilings and plenty of light from the tall windows make this place sparkle! Quaint brick buildings, cobblestones and gas lamps, restaurants, cafes, fabulous bakeries and cute boutiques - this is your neighborhood. Leave your car behind and walk to everything! With its attention to detail and comfort, this condo will welcome you back after a busy day exploring all that Boston has to offer. Please note, there is no washer/dryer in the apartment, but there are plenty of laundry facilities on Charles Street. The Boston Common Garage at Zero Charles St is just steps away. Start your day with a run along the river, then take in some history on the Freedom Trail. Head over to Newbury Street for serious shopping, and in the evening choose from dozens of restaurants ranging from cozy pubs to world renowned, or catch a show in the Theatre District - it is all within a few minutes scenic walk. For an enthusiastic appraisal of the neighborhood, read what VRBO (HomeAway's partner) wrote about our 3-bedroom condo in the same building: vrbo 285427. The Unique Benefits of this Condo: Location, location! Beacon Hill is the heart of this historic city, the most central location from which to explore the best of Boston. All the major tourist attractions are easily accessible, most of them within a short walk. At the same time, Beacon Hill is a real neighborhood with grocery stores, a bakery, a post office, as well as boutiques and cafes, where you will feel welcome and at home. My husband and I hail from Ireland and France originally, and met as students at UC Berkeley. We have lived in Boston for almost 3 decades, and absolutely love the city. Boston is beautiful, historic, the most European of American cities. It is very user-friendly, very walkable, and offers a wonderful array of activities and destinations within the city itself - something to delight everyone. Landline telephone with free service throughout the USA. Cozy apartment! Warm and comfortable bedding! Everything we needed was available! I highly recommend a stay here! My husband and I had a lovely time staying at this sweet Beacon Hill apartment. Caroline’s place was exceptionally quiet, clean and comfortable. It is wonderfully located just a short walk to some of Boston’s finest restaurants and shops. During our visit they closed Charles street to traffic one night for a Christmas celebration in the street, which highlighted the delightful neighborhood feel of this area. It was great to be so close to the Boston Commons and Public Garden where the trees were hung with lights and were just magical. Altogether a very romantic visit. I highly recommend this rental and plan to return some time soon! The apartment was the perfect safe location for our six nights in Boston with our 13 year-old grandson. We loved the convenience of walking to shop at Whole Foods and Dulacca’s Market and being able to fix most breakfasts and dinner meals at the apartment. We were only minutes from the Hop-on Hop-off Trolley, “T” stops, a movie theater, Boston Commons for the start of our Freedom Trail Tour, and Charles Street with its many shops and eating places. When we couldn’t walk because of rain and very cold temperatures, Uber was only minutes away to any location we wanted to go. The apartment was quiet and comfortable with the amenities that we expected. We enjoyed looking down the street to see gas lights lit 24 hours a day. We would definitely recommend this place and would eagerly stay here the next time. We came to Boston. The apartment was only lacking two things for us: a luggage rack for the closet, and a bar stool for the counter. Thank you very much for the wonderful review! I appreciate it. Thanks too for suggesting a luggage rack and a bar stool would be good additions. I appreciate the feedback, and both have been ordered. Thanks for having been great guests! Hope you stay here again next time you come to Boston. We came to Boston for a long weekend and staying here made the trip extra special. Its location is a block away from Charles Street which has loads of wonderful restaurants and shops. We ate at several breakfast places, with our favorite being Panificio Bistro & Bakery. The apartment itself is decorated nicely. The bed was very comfortable. Additionally it is always a satisfying feeling after a long day, if one person is ready to go to sleep, to be able to close the door on the separate bedroom and go to sleep. The apartment is on the second floor on a three-story building. 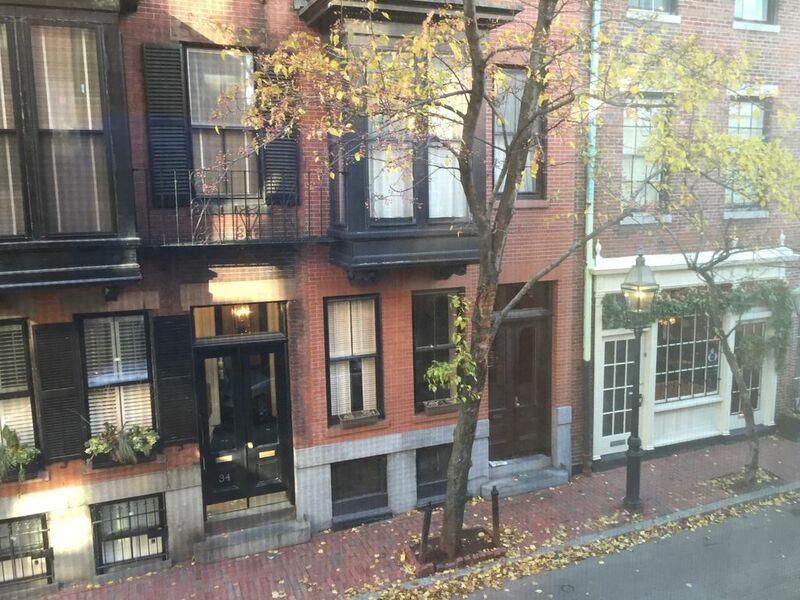 There is some upstairs noise, but this is also part of the charm of staying in the area of historic Beacon Hill. The owner was very easy to work with and answered questions quickly. She had multiple notes in the apartment for renters that was very helpful once you arrived. On a side note: we did arrive early into Boston-if you are also arriving in early without a car, there are luggage storage places that will store it until you can check in to the apartment. We would highly recommend this rental and would rent here again. Perfect spot to get to everything .. perfect apartment for our family. The apartment is located in a great spot off Charles St. in Boston. It’s spacious, comfortable and has a nice kitchen. Highly recommended. At this time, Boston does not impose a tax on short-term vacation rentals. If Massachusetts, or the City of Boston legislate a new tax requirement, then the new tax will be added to your rate.